Despite some misgivings, the Ankiros exposition in Istanbul successfully drew and enthused more than 14.000 visitors. The show´s widely varied and impressive exhibits were interesting for experts and laymen alike. The positive atmosphere at Ankiros was a catalyst for collusion and networking, encouraging many new ideas and transactions. Any prior concerns and warnings in relation to possible terror attacks proved to be unfounded. The fairs started on 28 September 2016 at 18:30 with the opening ceremony. After the speeches of Mr. Ibrahim Anil, Chairman of the Board of Hannover Messe Ankiros Fuarcılık A.Ş., Mr. Wolfgang LENARZ, Senior Vice President of Global Fairs - Deutsche Messe AG, Dr. Timo WÜRZ, General Secretary of CECOF / CEMAFON and Director of EUnited Metallurgy, PROF. DR. Onuralp YÜCEL, Chairman Of The Organizing Committee of 18 th International Metallurgy & Materials Congress, Mr. Tunçay ŞULAN, Chairman Of The Board of UCTEA - Chamber Of Metallurgical and Materials Engineers, Dr. Veysel YAYAN , General Secretary of T.C U.D - Turkish Steel Producers Association, Mr. Uğur KOCAOĞLU, Chairman of the Board of TUDOKSAD - Turkish Foundrymen’s Association, the fairs opened its doors for three days for visitors. On the first day of the fair, Minister of Science, Industry and Tecnology of Turkish Republic, Dr. Faruk Özlü also visited the fairs and had meetings with High Advisory Board of TCUD (Turkish Steel Producers Association). 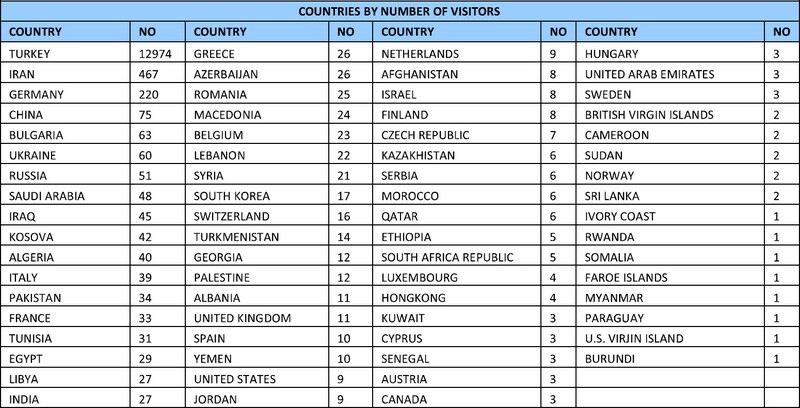 This year 1.753 international, total of 14.727 visitors from 70 countries had a chance to meet total of 985 exhibitors from 45 countries. ANKIROS/ANNOFER/TURKCAST 2016 Fairs hosted two congresses in the same venue that addressed the recent scientific and technologic developments in the metallurgy industry. “18 th International Metallurgy and Materials Congress” organized by UCTEA Chamber of Metallurgical and Materials Engineers and “8 th International Foundry Congress” organized by TUDOKSADTurkish Foundry Association These congresses offered an opportunity to discuss new products and studies, latest research results and challenges of the metallurgy industry. Important information about the latest scientific and technical works was transfered to the exhibitors on a huge spectrum, provided meeting on an international platform and transfering information and experience as mutual at IMMC 2016 Congress. 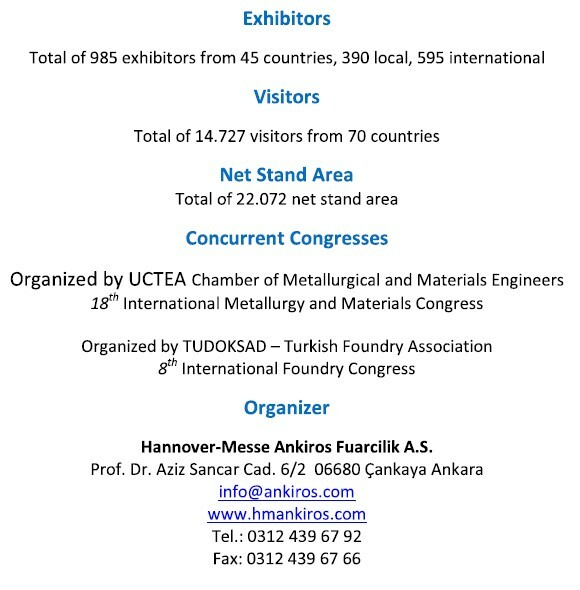 8 th International Foundry Congress End Report The 8th International Foundry Congress has been held successfully between 29th September - 1st October in TUYAP Istanbul Fair Congress & Convention Center Hall 7. This year, the congress has been held in the exhibition area and as open to the all visitors for the third time. In total, 8 sessions have been realized and the session themes have been defined as: Competitiveness of Foundry Sector, Casting Technologies Iron&Steel, Casting Technologies Non Ferrous, Moulding Technologies, Software&Technology In Foundry Industry and Inovation In Foundry Industry. 48 oral presentations have been made and 17 of them being from 8 different countries have bring our congress’ international importance and the common denominators of foundry sector to the fore. Succeeding years of experience in Foundry Business; Kubilay Dal joins the Ankiros Team.